We’d love your help. 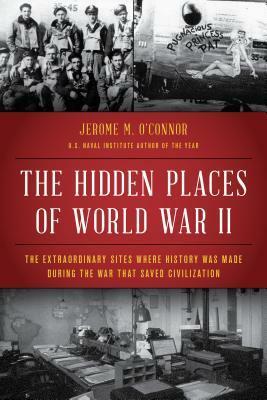 Let us know what’s wrong with this preview of The Hidden Places of World War II by Jerome M O'Connor. To ask other readers questions about The Hidden Places of World War II, please sign up. As a WWII aficionado, I enjoy books like this that teach me new, fascinating tidbits about the war. Some chapters are anecdotal like the one detailing Jimmy Stewart’s service, or the one about an English boy who became a mascot for an American flight crew. The chapter about Bletchley Park and decoding the Enigma was intriguing, and I especially appreciated the chapter dedicated to how Chicago-based business contributed to the war effort. I now know that O’Hare’s 3-letter abbreviation (ORD) stand As a WWII aficionado, I enjoy books like this that teach me new, fascinating tidbits about the war. Some chapters are anecdotal like the one detailing Jimmy Stewart’s service, or the one about an English boy who became a mascot for an American flight crew. The chapter about Bletchley Park and decoding the Enigma was intriguing, and I especially appreciated the chapter dedicated to how Chicago-based business contributed to the war effort. I now know that O’Hare’s 3-letter abbreviation (ORD) stands for Orchard Field, an assembly factory that existed during the war, and that Midway Airport is named after the famed Pacific battle. Sure there were some dry subjects. The first third of the book deals with maritime aspects, while another chunk is devoted to the numerous air bases throughout England. Otherwise, it was a decent, well-researched read about lesser-celebrated locales that were imperative during WWII. I have devoured each and every page of this book and I am truly sorry it had to end. The author and his extensive research with visits to overlooked but essential locations to the outcome of WWII took me with him in a sense. Though admittedly an unusual reaction to most accounts of this world event, I was transfixed from so many directions. It was not just the staggering statistics or only the real time human dilemmas faced but rather it was the author's refreshing way of conveying each with a style that was more like a time-traveling ride than a read. I could easily feel what it might have been like to stand with Ike at Southwick House as he struggled to come to a decision that could lead to victory as easily as defeat. The authors attention to detail allowed me to easily visualize the otherwise complicated deciphering machines in the Bletchley Park chapter. The chapters were filled with facts not previously known but it was the author's adept writing style that carried them and made the book impossible to put down. All senses were provoked, deep places were touched and new thoughts were inspired. This author has a gift. I entered the book yearning to learn more about this war that changed our world and came out the other end personally changed within. The Hidden Places of WWII was chock full of reasons to be proud to be an American and I am left brimming with appreciation for those who fought for our freedoms. Yes I am changed and I am awake and alert to my life in a new and refreshing way. As an American and a citizen of our world there are lessons to take away from this war and this book is its legacy. The author says we must never forget this story and what this country made possible by working together. This book sourced from first-hand facts, spoken from the heart and imprinted in our souls is for everyone to read and remember. The Hidden Places of World War II is described as taking the reader to forgotten or overlooked sites where WWII history was made. Included are such places as the U-boat bases along the Bay of Biscay; how the USAAF air bases were constructed in east England and what they entailed; Trent Park, where the British eavesdropped on captured German generals; the Cabinet War Rooms where Churchill directed the war; Bletchley Park, where the code breakers won the war. Many of these places are familiar to students of WWII, but there are surprises. The Queen Mary and the Queen Elizabeth famously brought thousands of American troops to Europe. Overlooked is that the British needed American troop transports, and ships were taken from the United States Line. The SS America, launched the day before the war began, became the USS West Point and moved personnel throughout the war. Chapters can stand alone, and there is some repetition between them. There is a recital of Schweinfurt, Big Week, Black Sunday, and Germany’s ability to quickly produce at near-normal capacity after a bombing. There’s a brief bio of Jimmy Stewart’s war service, and a discussion of General McAuliffe’s reply of “Nuts” to the German demand for the surrender of Bastogne. Lots of figures for the present-day strengths of the militaries of the US, Russia, England, Germany, and China. There’s a lot of interest here, and a lot that I breezed through. The author's painstaking research and attention to detail is obvious in the writing of this book. There were many facts that I only discovered after reading this!